Reformed University Fellowship (RUF) is more than just a university campus ministry; we seek to be a ministry for the university. We strive to serve at this unique stage of student life…in the world they live in; exploring together the Lordship of Christ in every area of life. We are the Church going to the campus with the message of Jesus Christ. As a ministry of the Presbyterian Church in America, RUF holds to the convictions of historic Christianity, which motivates our hearts for God and love for the university. These convictions include: the need for new life in Christ, the authority of the Scriptures, and the mission of the Church to reach and equip all people with the gospel message. 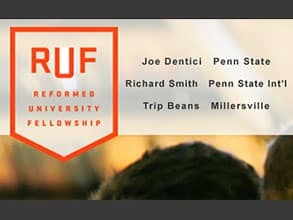 Joe Dentici is the campus minister of RUF at Penn State. He is a graduate of the University of Alabama at Birmingham (UAB) and of Beeson Divinity School, Samford University (M.Div.). He is an ordained minister in the Presbyterian Church in America (PCA), and is married to Melissa. Melissa is a registered nurse who formerly worked on a Bone-Marrow Transplant Unit in Birmingham. They have have one daughter, Anne Charlotte, a son, Cannon, and a black lab named Knox. Joe and Melissa are thrilled to be in Happy Valley. Richard Smith is the RUF International campus minister at Penn State University. He is a graduate of both Winthrop University in Rock Hill, South Carolina and Reformed Theological Seminary in Jackson, Mississippi. He is an ordained minister in the Presbyterian Church in America (PCA). His wife of 25 years, Lynne, was born and raised in Atlanta, GA. They have one son, Rick (22), who is currently at Georgia Southern University, and one daughter, Evelyn (20), who is married to Tony Powell and lives in New Jersey. Richard and Lynne are excited to be working with the many international students at Penn State University.